The following is a piece written as part of an interview I did at City University on the political and ethical significance of the Bradley Manning trial currently ongoing (links to potentially embarrassing video to follow). I think that the most important thing that the Bradley Manning trial shows us is the gap that opens up between our legal institutions and our sense of right and wrong, between the law and morality. Many people around the world are shocked by Manning’s imprisonment. 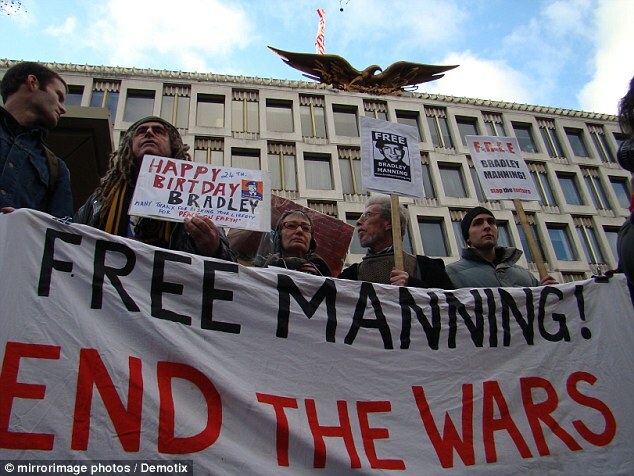 People are shocked partly because he has been held under conditions that the UN said violated his human rights, but also because Manning is being tried for exposing the actions of US soldiers and diplomats, including evidence of many potential and confirmed human rights violations. Manning’s supporters are incredulous and view the proceedings now taking place at Fort Meade as illegitimate. I understand this incredulity and on a level I share it. What I want to suggest, however, is that what we are seeing in the trial of this young man is even more troubling than the corruption of the law by politics – it reveals that the law is always suffused with politics. The law is a technical code. Yes, it is also a normative system that is supposed to determine right and wrong, guilt and innocence. But it is vital that we do not forget that it is a technical code first and foremost, a code that political authorities use to justify their power. Therefore, those with the capacity to influence and manipulate the legal code will always be at an advantage, will always be able to shape that code not towards the pursuit of justice but towards their own interests. This is what Finnish legal scholar Martti Koskenniemi calls this the gap between apology and utopia. The law has its utopian moments and this is especially true of human rights law – for example, Manning supporters see him as a hero who has exposed the grievous crimes of the US government and its military, particularly in Iraq and Afghanistan. They appeal to human rights standards that are quintessential moral claims, but which sadly lack the force of political authority and so are not reliably protected. This is important, but the law also has its moment of apology, where it serves the interests of established authorities, of powerful actors like the US government. This insight in and of itself is important for our understanding of the relationship between the law and politics, but there’s a further element of the Manning trial that I think is vital to focus on. The particular apology that the law is making for the authority of the US government is to make the telling of truths illegal. That is a vital idea to understand. The US government is claiming that telling the truth is against the law, and in Manning’s case, if that truth “aided” the enemy, then his punishment for exposing the truth could be life imprisonment. 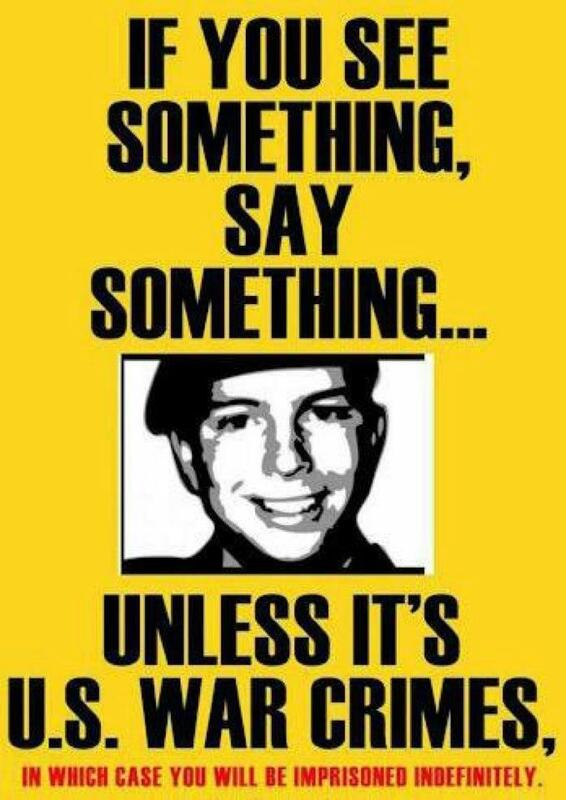 Now there have been attempts to discredit Manning (and we will hear more of this as the trial goes on as well) but whatever his reasons for publicising the truth of US actions, it is a disturbing move to try to make the truth illegal. I choose that awkward formulation intentionally. The US government claims to be preserving its state secrets, its security, but let us make no elisions here, the US government is claiming its security depends upon the government being able to criminalise the truth. The Manning trial also shows us another side of the law. We have seen a push back against the apologetic deferral to US power. Many have praised his actions because they brought a number of human rights violations to light. Others have taken up his cause because defending Manning’s actions is vital to defending freedom of the press and freedom of expression, and especially to protecting whistle-blowers. All of these are laudable uses of the law for moral ends – and one should not forget the work done to challenge Manning’s treatment after his arrest. Yet, there’s a wider issue at stake that has been under-emphasised: do we have a right to the truth? Initially this claim may sound strange. Can we have such a right? Is there even such a thing as truth? Leaving aside the philosophical complexities we could raise, I want to think back to 1945 as the United Nations was being set up and the Second World War was ending. One of the earliest conversations about human rights that went on within the Economic and Social Council of the United Nations was whether there should be a right to truth. What this meant to those discussing the issue at the time was that there should be a right to the free flow of information and a right to access accurate and reliable information. This was a right to truth, understood as a right, held by everyone, to have access to the best-confirmed knowledge available. This right was seen to be important because of how vital the use of propaganda and misinformation had been to the German war effort and to European Fascism in general. There was a clear sense that open-communication and the free transfer of information was harmful to authoritarian regimes, and that a right to truth would undermine unaccountable power everywhere. It should be noted, however, that this claim was not as radical as the one being made by activists like Julian Assange or Edward Snowden, as the representatives at the UN accepted that national security might require that some secrets be kept. It is this notion of a right to truth that I think is the vital issue at stake today at Fort Meade. Do democratic societies have a right to truth? Do democratic citizens? We can look to press freedoms and the freedom of speech, but these are related rights and actually dependent on a more fundamental right to truth. Yet we face a real difficulty here, as there is no legislated or established right to truth, rather it is something we feel we ought to have. In this instance the law is an apology for the power of states, like the US, who want to control who can know the truth, want to maintain their authority over the truth (which is why the NSA programme aims to gather data on such a massive scale), and want to preserve their power to misinform. In response to this we need to recognise the right to truth as a utopian claim, as far as the law is concerned. It is a beautiful moral ideal but it is not part of the technical code of the law, which is why a utopian claim to a right to truth must be supported with a political effort to create such a right. This claim takes us back to the Manning trial and the importance of understanding what is at stake. Yes, we should defend this young man’s rights. Yes, we should be concerned about the preservation of press freedom and the protection of whistle-blowers. Yes, we should seek justice for the crimes the US has committed. But at the same time we should also realise that there is a bigger political struggle going on here between, on one side, a government (and the US is hardly unique in this regard) intent on denying its citizens and the world access to the truth, and, on the other side, those who think that truth is vital to a truly democratic society. 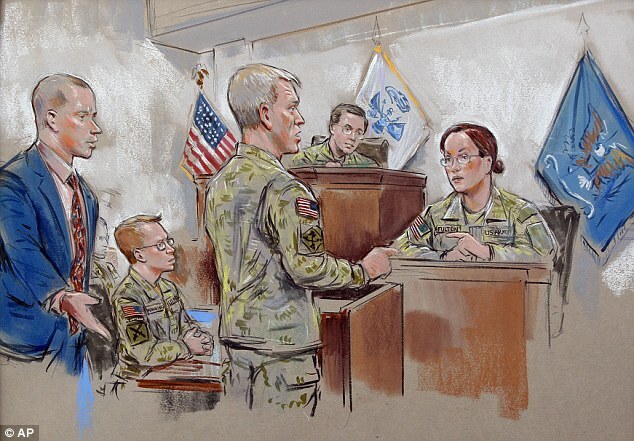 This is why what happens in the courtroom at Fort Meade is so important, and it is also why what is done outside the trial is just as important. States will be protecting their control over the truth. Democratic activists will be fighting for our right to the truth. How this battle plays out matters to the wider struggle for democracy, which is a struggle we must remember is on-going: in the US, the UK, Greece, Turkey, all over the world, anti-democratic forces are at work in the form of economic criminality, growing inequality, invasive and unaccountable governments, resurgent fascist groups taking to the streets and the prosecution of those trying to speak the truth. The trial of Bradley Manning is a moment that should focus the attention of anyone committed to a truly democratic society on the reality that we are living in precarious times. I think you are addressing a lot of different philosophical issues. Of course, I readily agree with you that we have a right to truth. I mean, so long as we have a democratic society, how can we possibly hold leaders accountable if we don’t have a right to the truth. Yet at the same time, truth is something no one seems to agree on – and it is this disagreement that gives rise to the political process. One thing I would say is that it’s important not to succumb to a normative view of the law. The law is not just the law because politicians say so. I would strongly recommend the first volume of F. A. Hayek’s _Law, Legislation, and Liberty_. Hayek makes a *secular* argument for something analogous to natural law. He sees law as arising via spontaneous experimentation, but also grounding itself in custom … this comes near to saying practice makes it so, but I think his position goes much deeper than this. I think, as you say, the right to know and hold our leaders accountable is an *objective* right in the sense that we can’t maintain our political system without it. We talk about natural scientific laws, when we presume those laws are true regardless of what we say or do about it. In some sense, what constitutes correct law is not something we can *choose* but is already chosen independent of what we say or do about it. Our knowledge may only be flawed and fallible, but without some absolute to fall back on, we are forced to give into absolute relativism and facile arguments regarding the use of power. Instead, we merely admit our knowledge is flawed, so we require tolerance, but at the same time treat our the law as something that cannot be whatever politicians want it to be. We may only know the truth partially, but it exists. This is a view that commend mutual respect with those we disagree with, and foregoes any type of authoritarianism, yet at the same time doesn’t give into relativism. I’m probably not parsing my words very well at all, but I can’t recommend Hayek’s book enough. Very important move to draw attention to the trial and its implications, which are by far not being discussed enough in public. I agree with you and think that the political/political theory implications of the trial are perhaps even more complex, as it is revealing a public disagreement about the morality/rightfulness of the law, thus drawing attention to the myth of representative democracy/unity of national will upon which state sovereignty, and its embodiment in the law, rests. As you point out, the Manning trial raises all kinds of questions: about the relationship between the individual and the government in the US – and the relationship to the state of both respectively, but also the racial/post-colonial hierarchies acted out in the US war on Iraq, where Iraqi lives are valued so much less than American ones. It also touches on the farcical ironies of the politics of human rights, in which a superpower mobilises them to justify a war in which it uses in-human violence, only to then violate the rights of someone who exposes this violence. Protestors against the trial are – mostly intuitively – picking up on all these galvanising dimensions; protecting the right of an individual to reveal immoral and criminal behaviour of the government is only, sort of, the lens through which all these super-important political questions are focused. So I’d argue that it’s not really (or just) the right to truth that is at stake, rather all the implications that are embedded in the knowledge-power relationship of individuals and government: who is allowed to know the truth about whom? The US government after all is not really criminalising the truth, but rather the act of inversing the knowledge-power structure between individual and government that it favorises. (An interesting reversal of this by the way is the disallowing of evidence that police obtained in an illegal manner – but too much of an excursion here). The PRISM programme shows just how far the US government is willing to use the state to its advantage in a quest to veil its own actions in secrecy while obtaining as much ‘truth’ about the lives of citizens. Very awful developments all around. Hi Sophie – thanks for the really insightful comment, which draws in things I wished I could bring up but didn’t have time/remit to do so. I didn’t spell it out very well here – in part because it’s something I’ve just started thinking about – but I’d want to argue that a right to truth is a right to exert democratic control over the knowledge-power relationships of individuals and government institutions. One point of contention is that I do think the US government is criminalising truth – not in the sense of criminalising a particular true statement but criminalising the processes by which particular truths are produced. The example of truth obtained in criminal investigations inappropriately is a case in point – who do such limitations serve? It seems at the moment in the US it is moving towards protecting the right of the government to possess and use information/truth as it sees fit and limiting the access of citizens and rolling back existing protections. Hi Joe – thanks for your reply. It’s stimulating, and somewhat mind boggling, to think about ‘truth’ in this way, and relevant for both political and academic work. As a ‘materialist’ I firmly do not believe that all truth is relative, but nevertheless, as the Manning trial (and other whistleblower events) shows, what can be understood as true depends so much on the extent of our knowledge – in this case of straightforward, empirical facts. So to go back on my initial position on the question around the criminalising of truth, perhaps an answer is that actually the US government is sanctioning some true statements – those that contradict the truth of its own myth making. Especially with regards to the information that is coming out of the Snowden scandal, about the direct lies of senior officials in public speeches, and the apparent lies requested from large companies to hide the ‘truth’, it seems quite clear that some truths were simply prohibited, in the overall attempt to create a different version of ‘reality’. Somewhat akin to the erasing of former, fallen comrades from official USSR photographs – just preemptively. As briefly mentioned, the Manning trial (and the related truth discussion) is very revelatory and of analytical power also with regards to humanitarianism/humanitarian intervention. While/Because the human rights violations of other governments increasingly merit the latter, those of the US have to be covered up and hidden to the extreme, which perhaps gives some insight into the extent of post-colonial governance that humanitarianism is providing.